National Distinguished Chair Professor (Highest Honor offered by the Ministry of Education Affairs, Taiwan) and Distinguished Research Fellow (Highest Honor Offered by NSC, Taiwan). Author name: "Gwo-Hshiung Tzeng" or "Gwo-Hsiung Tzeng" or "Gwo-Hshing Tzeng"
Institute of Technology Management, National Chiao Tung University; Room A705, 1001 Ta-Hsueh Road, Hsinchu 300, Taiwan. Bachelor Course in Business Management, Tatung Institute of Technology (Tatung University ) (August 1963 - June 1967). Master Course in Institute of Urban Planning, National Chung Hsing University (National Taipei University) (August 1969 - June 1971). Doctoral Course in Division for Research of Economics (Major in Management Science), Osaka University, Japan (April 1973 -August 1977). Second Lieutenant, Military Service of the Taiwan (July 1967 - June 1968). Teacher Assistant, Tatung Institute of Technology (July 1968 - June 1969). Researcher, China Urban Planning Center (July 1970 - March 1971 Part-time). Lecturer, Tatung Institute of Technology (July 1971 - March 1973 Part-time). Planner, Transportation Planning Board, Ministry of Communications (July 1971 -March 1973). Researcher, Research Institute of System Science in Japan (October 1973 - March 1976 Part-time). Researcher, Kansai Institute of Information System in Japan (April 1976 - June 1977 Part-time). Associate Professor (MOE, ID: 5290), the Graduate School in Business Administration, Tatung Institute of Technology (August 1977 - July 1978). Resident Associate, Energy & Environmental Systems Division, Argonne National Laboratory (Visiting Research) July 1981 - January 1982. Visiting Professor, Department of Civil Engineering, University of Maryland at College Park (August 1989 - August 1990). Professor, Institute of Traffic and Transportation, National Chiao Tung University (August 1981 to present), (MOE, ID: 4332). Visiting Professor (Visiting Scholar), Department of Engineering and Economic Systems and Operations Research (EESOR), Energy Modeling Forum (EMF), Stanford University (August 1997 – August 1998). 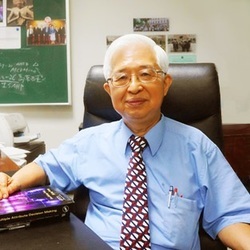 Chair Professor, Institute of Management of Technology, National Chiao Tung University (August 2000 to present); Chairman, Institute of Management of Technology, National Chiao Tung University (August 2002 to July 2004). President, Kainan University (August 1, 2004 – January 31, 2005). Distinguished Chair Professor, Kainan University (February 1, 2005 – July 31, 2013). Distinguished Research Award of the National Science Council, Taiwan, 1985-1986. Distinguished Research Award of the National Science Council, Taiwan, 1993-1994. Distinguished Research Award of the National Science Council, Taiwan, 1995-1996. Distinguished Research Fellow Award (Whole-life-time Highest Honor Offered) by the National Science Council, Taiwan, 2000 - Now. Distinguished Research Fellow (Highest Honor Offered) by the National Science Council, Taiwan, 1997-2000. Distinguished Research Fellow (Highest Honor Offered) by the National Science Council, Taiwan, 2000—2003. National Distinguished Chair Professor, Award of the Ministry of Education Affairs, Taiwan, 2000-2003. Chair Professor of National Chiao Tung University (from 2003~ a whole-life-time honor). Life Fellow Award (2010) on ISME (International Society of Management Engineers). Ministry of Education Affairs, Taiwan (National Chiao Tung University), 1992. For the most gracious hospitality, and for the outstanding leadership and resourcefulness in organizing, managing and chairing the Tenth International Conference on MCDM, Taipei, Taiwan, July 1992.
International Society on Multiple Criteria Decision Making. As the highest distinction that the International Society on Multiple Criteria Decision Making bestows upon a researcher who, over his career, has established a record of creativity to the extent that the field of MCDM would not exist in its current form without the far-reaching contributions from this distinguished scholar. 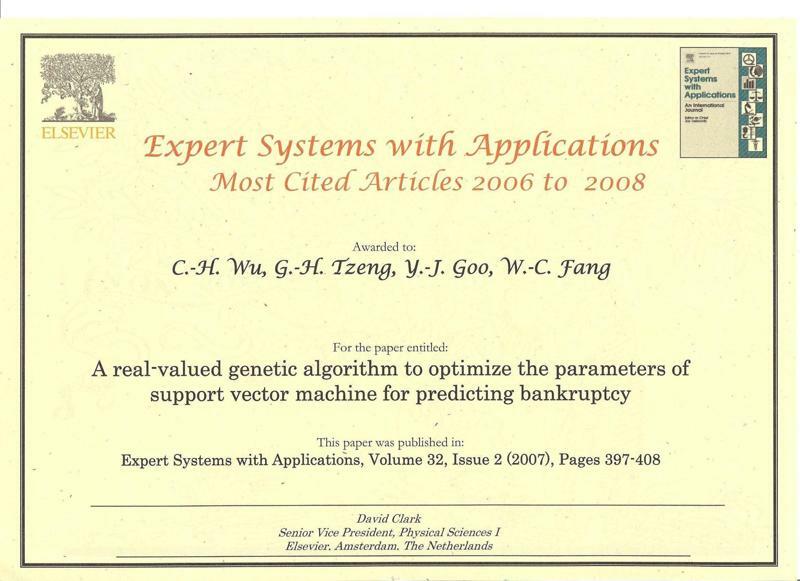 The MCDM Edgeworth-Pareto Award Presented to Gwo-Hshiung Tzeng by International Society on Multiple Criteria Decision Making, June 23, 2009. Life Fellow Award is presented to Gwo-Hshiung Tzeng for his contribution to the society for 7 years. International Society of Management Engineers at the International Symposium on Management Engineering, August 26-28, 2010, Kitakyushu International Conference Center, Kitakyushu, Japan. Co-Chairmen of International Conference on Information and Systems, September 3-6, 1992, Dalian, China. Special Speaker (Keynote Talk) of IML2008 (one hour) Asia Conference on Intelligent Manufacturing & Logistics Systems (IML 2008), “New Frontiers of Multiple Criteria Decision Making (Tutorial Talk)”, February 25-27, 2008, Kitakushu, Japan. The Eighth International Symposium on Management Engineering, August 22 (Monday) - August 25 (Friday), 2011, Chang Yung-Fa Foundation Hall, Taipai, Taiwan. Keynote Tutorial (one hour on Opening) of ISME2011 (The Eighth International Symposium on Management Engineering 2011). 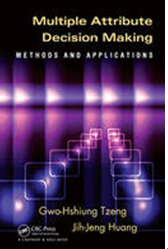 Topic: "New Frontiers on Multiple Attribute Decision Making: Methods and Applications", in Chang Yung-Fa Foundation Hall, Taipei, Taiwan, August 22 (Monday) - August 25 (Friday), 2011)). Keynote Speaker (one hour) of the 19th National Conference on Fuzzy Theory and its Applications, September 18-19, 2011, National Formosa University, Taiwan. Keynote talk: New Frontiers of “Hybrid Fuzzy MCDM Model for Improving and Creating the Best Systems in Applications. Talk speech in Vilnius Gediminas Technical University (VGTU), Vilnius, Lithuania on July 5, 2012. Talk topic: A New Hybrid MADM Model for Problems-Improvement. Tutorial in The Ninth Symposium Organized by International Society of Management Engineers (ISME 2012), August 22-25, 2012, Kitakyushu International Conference Center, Kokura, Kitakyushu, Japan. Topic: A New concepts and trends of Hybrid MCDM Model for Problems-Improvement. The Best Paper Award: New Thinking of Multi-Objective Programming with Changeable Space - In Search of Excellence by Jih-Jeng Huanga, Gwo-Hshiung Tzeng. In the Ninth Symposium Organized by International Society of Management Engineers (ISME 2012), August 22-25, 2012, Kitakyushu International Conference Center, Kokura, Kitakyushu, Japan. Jih-Jeng Huang, Gwo-Hshiung Tzeng (2014), New thinking of multi-objective programming with changeable spaces - In search of excellence, Technological and Economic Development of Economy, 20(2): 242–261. Gwo-Hshiung Tzeng, Kao-Yi Shen (February 2017). New Concepts and Trends of Hybrid Multiple Criteria Decision Making, CRC Press, Taylor & Francis Group, In Press. The First International Conference on Information Technology and Quantitative Management (ITQM 2013), May 16-18, 2013. The Best Paper Award: New Thinking of Multi-Objective Programming with Changeable Space - In Search of Excellence by Jih-Jeng Huanga, Gwo-Hshiung Tzeng. In the Ninth Symposium Organized by International Society of Management Engineers (ISME 2012), August 22-25, 2012, Kitakyushu International Conference Center, Kokura, Kit﻿akyushu, Japan.